The City Daily Photo theme for September is “Rust and Ruins”. This picture of a fence post (or two) falls into the first category. 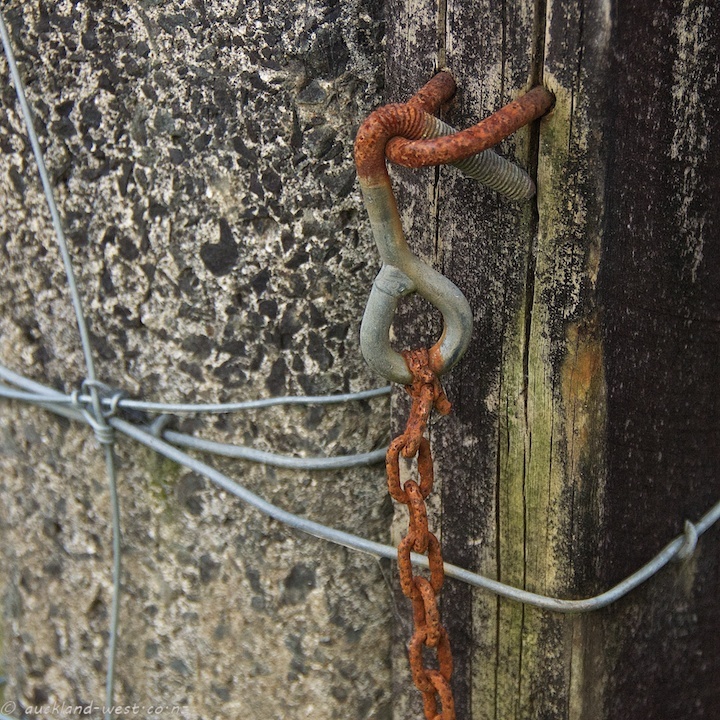 Trusty number 8 wire and rusty chain. Click here for interpretations from around the world concerning “Rust and Ruins”. Such a nice combination of textures and colors there. Great composition – almost abstract. Ikt’s a wonderful image for theme day, or any other day for that matter! Great find!! Uh oh, I wouldn’t trust the hook or staple to hold any weight. Thanks for your visit. You’d wonder why they didn’t use the same metal for the entire hook and chain, wouldn’t you? Lovely red. Fits well to my nails 🙂 . A simple and wonderful image for this theme, well done, Paul !